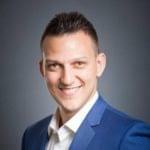 How to use Firebug with FireQuery to inject jQuery Code into a webpage. Firebug should now appear as one of your Firefox add-ons. Note: If your currently using Firefox it will ask to restart the browser to finalise the install. 3. You should now see a little bug icon at the bottom right of your browser. 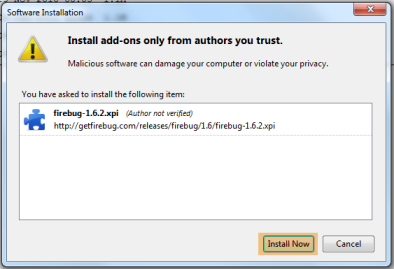 This is the firebug icon which you can click to activate firebug. Enable the script panel if it is disabled. Select the jQuery script you wish to inspect. The jQuery code should now be visible and ready to inspect & debug. With FireQuery you can inject your jQuery into any web page live (sounds great doesn’t it!). Make sure when you install FireQuery that it works with your Firebug version and browser version (try it on the test page link below). It is still in early stages of “life” so be aware that it may not be perfect – but with 234,000 downloads who’s going to argue with that?! Use the command prompt to run some jQuery code on the webpages DOM elements. 3. 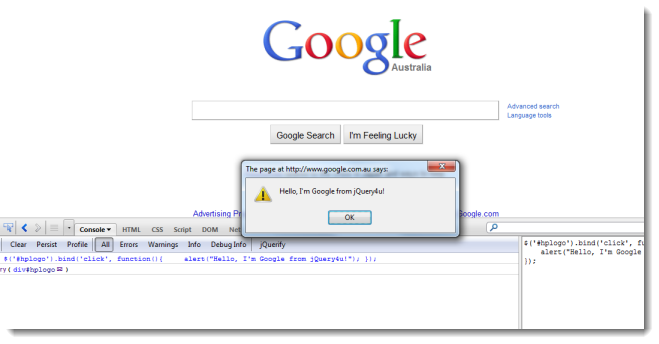 Click jQuery (click the”jQuerify” button). Now clicking on the Google logo should display your message!